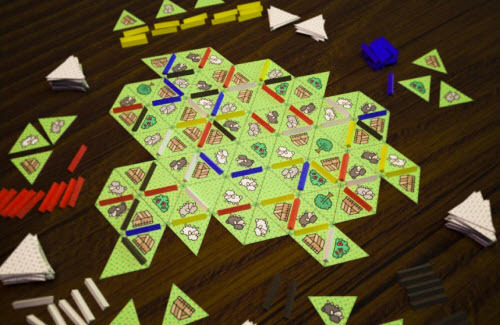 Baa is a tile-laying game from Joshua Chao for 2-5 players. The tiles are triangular and contain three types of sheep, trees, bushes, and cotes. Lay a tile and place a fence. The person with the most fences around an enclosed area scores points. Pretty simple stuff. Theoretically it’s available for $11 on eBay, but the item has ended. Try emailing him for more info.